Ashbourne Donaghmore Parish is essentially divided in two by the main road running through the centre of the village. Areas to the west of this divide, from Millbourne, Johnswood and Brindley Park at the north of the village, to Baltrasna and Muckerstown to the south, fall under the responsibility of Fr. Ciaran Clarke, Curate for the Parish. The east of the town, from Rath Lodge and Racehill in the north, to Greenogue and Bullstown further south, fall under the repsonsibility of Fr. 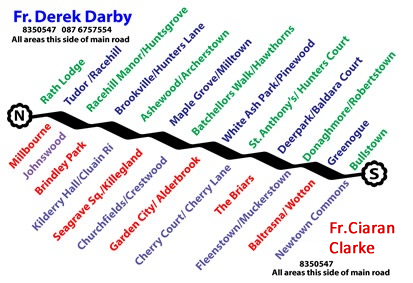 Derek Darby, Parish Priest.